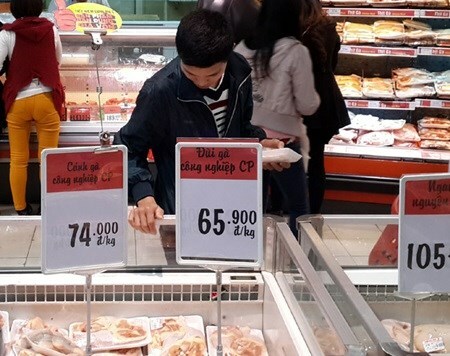 A total of 45,651 tonnes of chicken products, mostly frozen thighs, were imported from the US in the first seven months of 2015, accounting for 49 percent of total meat imports into Vietnam in the period, the Quan doi Nhan dan newspaper said quoted the Department of Animal Health source. The Department also said all US chicken products have an expiry date of at least seven months from manufacture date printed on the packages when arriving at the country’s border gates, citing reports from border veterinary units. According to the department, all US chicken products have their origins from producers licensed to export to Vietnam in line with regulations of the Vietnamese Ministry of Agriculture and Rural Development’s circular 25/2010//TT-BNNPTNT dated April 8, 2010. All those US producers also possess certificates on hygiene and food safety hazard analysis and critical control points (HACCP) under US rules. All frozen chicken products from the US have been certified by the US Department of Agriculture as meeting food hygiene and safety standards. Vietnam’s Ministry of Health has been testing samples from all batches of imported chicken products, with only one batch of 749kg of breaded chicken found to have been contaminated with Salmonella bacterium, which was then destroyed. In the first 7 months of this year, 35 samples of imported US chicken products were tested, with 17 samples found to contain some antibiotics but well within the permissible levels.